Nasare P*, Joshi A**, Pardeshi S***, Gupta AS****. Uterine rupture is a rare but catastrophic complication of instrumental delivery. Forceps delivery is considered to cause more major maternal injuries (like uterine rupture, colporrhexis, perineal tears) as compared to vacuum delivery. Here, we present a case of uterine rupture in a gravida who not only had a forceps delivery but also received fundal pressure to aid delivery. Uterine rupture leading to postpartum hemorrhage (PPH) is a rare but serious complication. PPH is a leading cause of maternal morbidity and mortality. Traumatic PPH is the second most common cause for PPH. Instrumental delivery being the most common cause resulting in this complication. Early detection and prompt intervention can save a life. A multidisciplinary approach with effective teamwork, availability of blood and blood products and well-equipped intensive care management are crucial in determining the outcome. A 34 year old gravida 3 para 2 living 2 abortion 1, day one of full term forceps delivery was referred to the emergency medical services in view of sudden onset abdominal pain and breathlessness post-delivery. On a detailed history it was learnt that the she had been admitted one day prior in labor. The details regarding progress of labor were not available. However she required forceps application in view of fetal distress in second stage of labor. She also mentioned that while the forceps delivery was ongoing another person in the labor room whom she could not identify gave fundal pressure on her upper abdomen and she was told to bear down simultaneously. She delivered a male baby weighing 2.8 kilograms but baby did not cry immediately. After resuscitation, baby was shifted to NICU for further monitoring. She developed sudden onset pain in abdomen and breathlessness post-delivery, hence she was transferred to another center for further management. After reaching the transferred center, blood investigations were sent and an ultrasonography abdomen was done, which was suggestive of mild ascites and mild left sided pleural effusion. On a complete hemogram report, hemoglobin was 6.5 gram% and WBC and platelet count were within normal limit. Hence she was transfused one packed cell volume and immediately transferred to our center. On examination her general condition was moderate, she was conscious and well oriented, clinically severe pallor was present, pulse rate was 110 per minute, low volume, blood pressure was 90/60 millimeter of mercury. Her respiratory rate was 30 per minute and saturation on pulse oximetry was 97 % on oxygen inhalation by mask. The cardiovascular and respiratory system examination revealed no abnormality. On abdominal examination gross distension was noted, exact uterine contour could not be made out. A baseline abdominal girth was measured. On per vaginal examination a vaginal pack was noted in situ. An intravenous access was obtained and intravenous fluids were started for the initial resuscitation while cross matched blood was being arranged. An ultrasonography of abdomen was done, which revealed a probable uterine rupture in anterior wall of lower uterine segment with moderate fluid in pelvic cavity with internal echoes. On abdominal paracentesis blood that did not clot was aspirated confirming the clinical suspicion of uterine rupture. A decision for exploratory laparotomy and obstetric hysterectomy if needed was taken. Since her blood group was ‘A’ negative, a major hurdle occurred due to acute shortage of the same. A senior blood transfusion medicine officer was consulted regarding transfusing O negative blood. Since it was a life-saving surgery, it was advised to transfuse O negative blood but with the precaution that ‘A’ negative blood if subsequently procured should not be transfused in the next 48 hours to avoid major transfusion reactions. Meanwhile, her vital parameters were monitored strictly. After all necessary arrangements were made, she was taken for exploratory laparotomy. Immediately after starting the first blood transfusion, the procedure was begun. In lithotomy position, the vaginal pack was removed, a cervical tracing was done. One sutured cervical tear was located at 10 o’clock position however the apex of the tear could not be identified and it seemed to extend beyond the fornix. Abdominal exploration was done through a midline vertical incision. On opening the parietal peritoneum, hemoperitoneum of around 500 ml was suctioned out. A uterine rent was noted in its right lateral aspect almost up to the right sided cornua and its lower extension was in continuation with the vaginal wall colporrhexis. The nature of the rupture warranted the need for an obstetric hysterectomy. A total obstetric hysterectomy was done. Owing to the close relation of the ureters to the vaginal vault and colporrhexis which was present, the urologists were called to trace the ureters and rule out any bladder injury. Ureters on both sides were found to be normal. As the entire lower extent of the rent could not be seen abdominally a digital examination done with full aseptic precautions helped in identifying the lower end of the rent which was not seen on the prior vaginal examination. This rent was then closed with polygalactin no 2-0. The bladder muscularis was found to be thinned out on the right posterolateral aspect of bladder (approximately 2 cm in length) and the bladder mucosa was protruding out. This was repaired with polygalactin 3-0 and was further reinforced by placing an omental patch. Methylene blue test was performed at the end, which revealed no leak of the dye from the urinary bladder. An intra-peritoneal drain was kept and the abdomen was closed in layers. Figure 1. Complete rupture of the right lateral uterine wall (yellow arrow). Black arrow shows the right round ligament. Figure 2. Rupture uterus specimen showing the entire right lateral wall rupture extending from just below the cornua to the external os. She required a total 4 units of blood transfusion (1st A-ve and the subsequent 3 units were O –ve cross matched blood units) and 4 units of fresh frozen plasma. Post procedure she was shifted to the ICU for the first 24 hours after which she was shifted to the ward. The intraperitoneal drain was removed on the third post operative day. Urologist advised continued catheter drainage for three weeks. Catheter was removed after 3 weeks. She had no urinary complaints after removing the transurethral Foley’s catheter. Her postnatal course was uneventful. Her baby was discharged from NICU after 7 days where he was kept for birth asphyxia. Uterine rupture is an obstetric emergency which is life threatening both to the mother as well as the fetus. It is defined as a breach in the integrity of the myometrial wall. Depending upon the extent of injury, there are two types of uterine rupture, complete and incomplete. In a complete rupture the contents of the uterus may spill into the peritoneal cavity or the broad ligament. While in an incomplete rupture the visceral peritoneum is intact. The most common cause for uterine rupture is a previous scarred uterus. Rupture of an unscarred uterus is a rare entity with an incidence of 1 in 8000-15,000 deliveries. It occurs mainly due to vigorous use of oxytocin or prostaglandins for induction or augmentation of labor, inappropriate use of instrumental delivery and fundal pressure during delivery. Other ancillary factors that contribute to this risk include grand multiparity, obstructed labor, larger birth weight, shoulder dystocia, higher body mass index (BMI), uterine anomalies or manual removal of the placenta. In our patient, the identified risk factors were multiparity, fundal pressure and instrumental delivery. A study conducted in Mali showed that, out of the total uterine ruptures that presented during the study course, 87.4% were noted in an unscarred uterus while 12.6% occurred in a scarred uterus. The observed risk factors for primary uterine rupture in their study were: dystocia coupled with oxytocin use (12.6%), malpresentations (12.4%), contracted pelvis (12.0%), fetal macrosomia (9.7%), and a contracted pelvis with macrosomia (3.4%). Grand multiparity comprised of 12.4% of all uterine ruptures while short inter-pregnancy interval was observed in 12.0% of the uterine ruptures. In our case, the patient was a multipara with previous uneventful vaginal delivery. In the present pregnancy, a forceps delivery was done for fetal distress in the second stage of labor. Details regarding the progress of labor, use of uterotonic agents, examination findings at the time of forceps delivery were not available. A detailed history was suggestive of use of fundal pressure for delivery which probably was a most significant contributory factor leading to uterine rupture. Fundal pressure involves applying a steady pressure over the uterine fundus. It is a controversial maneuver with no proven documented benefit, but few adverse events have been reported in association with its use. The uterine rupture can occur antepartum, intrapartum or postpartum. The most common time of presentation is intrapartum. Intrapartum rupture is usually detected after a sudden increase in maternal pulse rate and a decrease in blood pressure with vaginal bleeding and abdominal pain accompanied by fetal bradycardia . However, in the postpartum period, a clinical diagnosis is difficult and it requires high index of suspicion. Literature search revealed a case report of a postpartum uterine rupture which was diagnosed 4 days post-delivery. It described a patient who had complaints of lower quadrant abdominal pain for 4 days post vaginal delivery. 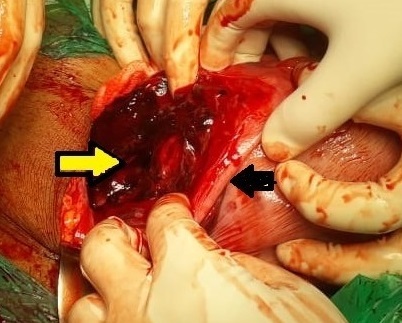 Treatment of uterine rupture mainly depends upon the prompt detection of the rupture, the extent of the rent, hemodynamic condition of the patient, feasibility of repair and expertise of the operating surgeon. In most of the cases an obstetric hysterectomy may be required as a life-saving procedure. In our case also obstetric hysterectomy was performed as the uterine rent was extensive and uterus was not in a salvageable condition. Besides this the tear had gone beyond the vaginal fornix, was very ragged, edges were not identifiable hence suturing of the rupture was not done. It is observed that perinatal mortality is higher than maternal mortality in uterine rupture. [7,8] As the baby was live born but severely asphyxiated, it is suspected that this rupture might have occurred while the fundal pressure and forceps traction were being given.. Uterine rupture in an unscarred uterus is an avoidable complication. Fundal pressures have no benefit and only cause harm and should be avoided. Even an instrumental delivery that is forcibly performed results in grave maternal and fetal injuries and complications. Iatrogenic uterine rupture cannot be justified for any reasons and practices that cause it can only be condemned. Pan HS, Huang LW, Hwang JL, Lee CY, Tsai YL, Cheng WC. 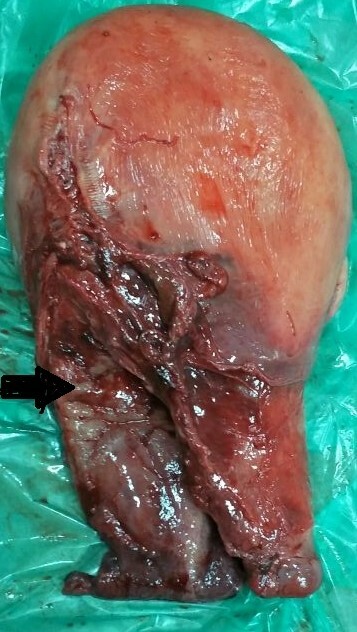 Uterine rupture in an unscarred uterus after application of fundal pressure. A case report. Journal of Reproductive Medicine. 2002;47(12):1044–6. Wang PH, Yuan CC, Chao HT, Yang MJ, Ng HT. Posterior uterine wall rupture during labour. Human Reproduction. 2000; 15(5): 1198–1199. Teguete I, Traore Y, Sissoko A, Djire MY, Thera A, Dolo T, et al. Determining factors of cesarean delivery trends in developing countries: lessons from point G National Hospital (Bamako-Mali). INTECH Open Access. 2012; pp. 161–202. Wei SC, Chen CP. Uterine Rupture due to Traumatic Assisted Fundal Pressure. Taiwan Journal of Obstetric and Gynecology . 2006;45(2):170–2. Sweeten KM, Graves WK, Athanassiou A. Spontaneous rupture of the unscarred uterus. Am J Obstet Gynecol. 1995;172(6):1855-6. Hruska KM, Coughlin BF, Coggins AA, Wiczyk HP. MRI diagnosis of spontaneous uterine rupture of an unscarred uterus. Emergency Radiology. 2006;12(4):186–188. Cisse CT, Faye EO, de Bernis L, Diadhiou F. [Uterine rupture in Senegal. Epidemiology and quality of management]. Medecine Tropicale: Revue Du Corps de Sante Colonial [Med Trop (Mars)] 2002;62 (6):619-22. Vangeenderhuysen C, Souidi A. [Uterine rupture of pregnant uterus: study of a continuous series of 63 cases at the referral maternity of Niamey (Niger)]. Med Trop (Mars). 2002 ;62(6):615–8.